Welcome to the official week 3 of the new Top Team Comps! This week's team comp somewhat of a flavor of the month powerhouse stomp comp. As you can tell, I've included many of the most popular champions on the rift today, all of which synergize extremely well with each other. Consequently, this team is very difficult to beat right now both in lane and most assuredly in teamfights. 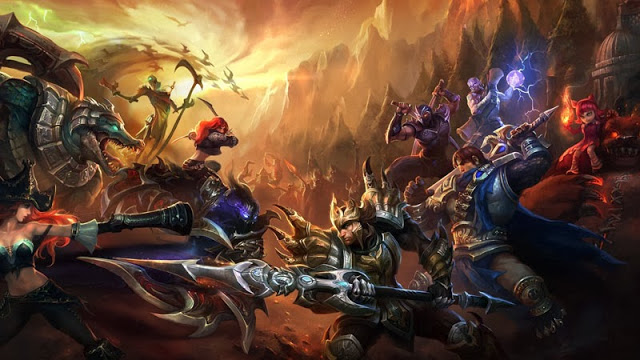 If you're looking to grind out some easy 5 man wins in normals, this one might be your go-to! This team focuses on multiple sources of initiation combined with strong synergizes between champions. Although it can lack in damage when surrounded or out-manuevered, in most cases it's a very strong team composition that will do well in most scenarios. Initiation - Key initiating patterns include Sivir ultimate, Kennen ultimate, Hecarim ultimate, or Annie flash + stun. Although Ahri can also ult and charm as well, most of the time it's a less desirable and more risky form of initiation. Most of the time, the initiator will be whoever happens to have flash up. Anti-Initiation - Consequently, this team also does very well as an anti-initiating team with its high CC and survivability via mobility. Mobility - Due to the high amount of natural mobility almost all the champions have combined with the mobility granted by Sivir's ultimate, this team has very strong engaging potential. Stay grouped, this team's split push power is low and team-fighting abilities are high. Click here for more team comps! Also, while graves might be good against their late-game hard engage, early game sivir simply destroys him with most of his damage dependent on a single spell, his buckshot. SSJ, what would you think of this team comp? I'd say that works well! How would it affect on swapping annie for leo? If Hecarim takes Smite and TP, the split push can be extremely potent. Easy to TP in, ult in, demolish all. Might I suggest adding wave clear as one of the categories? with Shen support and Ryze mid cuz it's season 2. How could I have not seen that! Main focus of this team is skirmish and teamfight ability. Poke is substituted for an "All-In" playstyle, where Nunu and Gallio's Ult's provide both high cc and damage if they detonate. This coupled with Lissandras ability to either engage and ult on herself or lockdown the strongest target (which also produces area cc) gives way for Riven to easily ult and potentially penta if the enemy team is grouped. Kalista & Galio combo allows for speedy ganks (Righteous Gust) and her ult would allow for Galio to get perfect position for his. Nunu is the preferred jungler but Amunu can have a similar effect but with much less jungle control. Can be countered by high poke team comps, teams with more than 2 champs with an escape and champions that directly counter Riven top. In my opinion you stack to much CC which sure is great for a kalista, but it ain't really any "peel CC" Execept for braum. Thing is when you got things like amumu, malphite and orianna, your need really great teamwork and timings to pull that of. If we follow your idea (which is the best possible way to pull it of) Then if Amumu hits ult on 1-2 people, it's all power burned on 2 people. Which in best case is the adc and jungler/ APC without znonyas. In that case it might work. In any case where the adc stays outside the compo you will get rekted or if they have a hypercarry midlane (such as azir/xerath) that could be enough. I would say you put in something like a kassadin/leblanc/ahri midlane just to clean up everything that you doesn't get in the compo. I still believe that the 450 IP team comp is almost as unbeatable as the most expensive all 6300 IP comp. Garen becomes impossible to kill unless enemy team commits hard CC or both carries to burst him down. He brings great AOE damage and very useful silence to team fights. Timed correctly, Garen can drastically reduce burst damage with a well placed silence. Garen's ultimate is very good at executing enemy tanks and his innate tankiness ensures that he can push lanes without recalling after a positive team fight. Master Yi is the clean up (Like I say, the unseen Yi is the deadliest) he lives for the chase and to murder people running away after lost team fights. He does not bring a lot to the table but there is none like him when it comes to cleaning up teams after they have used their CC, Ultimates and items like Zhonya. His ability to split push is better than Tryndamere and Jax and he can always pull 2 people away who come to stop his onslaught. Kayle: Kayle may not bring a lot of instant burst to the table but she has insane output of AOE damage, slow, heal and invulnerability which gels very well with her team mates who go into the thick of things in all team fights. Ashe/ Sivir aren't outplay adc like a Vayne or Tristana but they bring tons of utility while also doing consistent damage. Ashe/ Sivir's ultimate can turn around team fights on their own. Their chasing and disengaging power are unrivaled and they are so easy to learn. Annie is the single most oppressive support in the bot lane. No support can make carries rush non essential items like hexdrinker over damage in the early game. Her stun is very reliable, each engage ensures a kill or a summoner's spell and recall; making the enemy team fall behind. She can roam well and help mid lane often. Late game her engage almost always ensure dead carries and she is very reliable in team fights. In my composition, 4 champions need to be taken down immediately which divides the attention of opponents ensuring swift kills, engages and disengages as we want. Please tell me what you think about it. I feel like Amumu would be a nice replacement for Hecarim, and that Leona would replace Annie. This team lacks some tankieness, and the replacements would give about or maybe more than enough cc. There may be less damage, but I think the increased tankieness might help.